Evaluation of surface temperatures simulated with different vertical resolutions (from left to right) using station data over eastern Asia archived by NOAA. This helped researchers identify the optimal vertical resolution for accurately simulating sea fog. Courtesy of the Center for Analysis and Prediction of Storms (CAPS), University of Oklahoma. A recently published study by an international team of researchers has shed new light on how and why a particular type of sea fog forms, using detailed supercomputer simulations to provide more accurate predictions of its occurrence and patterns to help reduce the number of maritime mishaps. 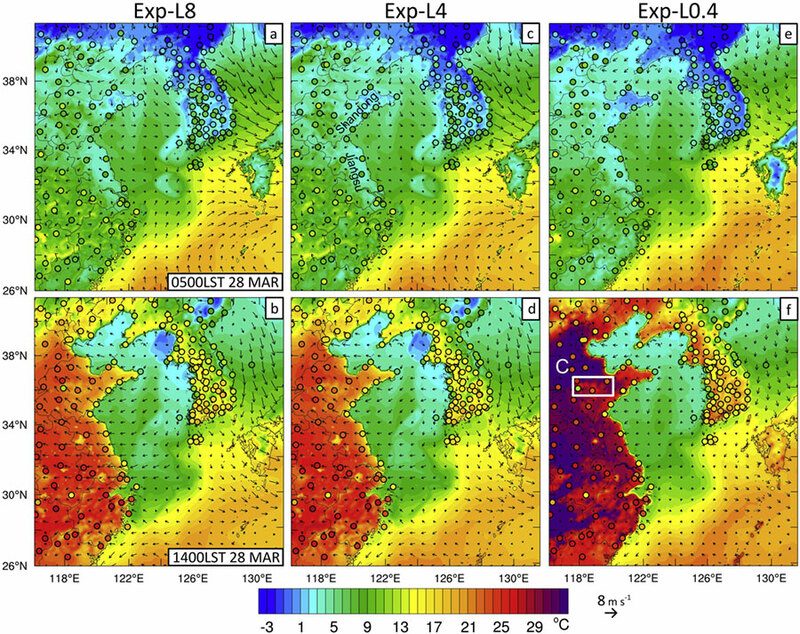 The study, published in the January 1, 2019 issue of Atmospheric Research, focused on a significant sea fog event that stretched approximately 400 miles across the Yellow Sea and its surrounding land. Images captured by the Moderate Resolution Imaging Spectroradiometer (MODIS) on the Aqua satellite allowed the research team to better explain the sensitivity of sea fog simulations to vertical resolution. Researchers used the Comet supercomputer at the San Diego Supercomputer Center (SDSC), an Organized Research Unit of UC San Diego, to develop detailed simulations. NASA data affirms that spring fogs can occur for 50-80 days per year across the Yellow Sea. The fogs occur within the marine atmospheric boundary layer and are responsible for as many as half of the shipping accidents at the Qingdao port, according to the Chinese government. The primary type of fog covering the Yellow Sea is called advection fog, which usually forms when warm, moist air moves into areas with a cold surface. While many previous studies focus on the effects of vertical resolution to better predict atmospheric events such as precipitation and hurricanes, this study aimed to achieve the best prediction of sea fogs using refined vertical resolution, according to the researchers. The study was conducted by Ocean University of China researchers Yue Yang and Shanhong Gao, and University of Oklahoma researchers Hu and Yongming Wang. The team used the Weather Research and Forecasting (WRF) model to simulate the selected sea fog and examined sensitivity of the WRF simulationsto different vertical resolutions in order to provide insight regarding how the fogs form, as well as developing optimal model configurations to better predict sea fogs. The researchers have been using SDSC’s Comet supercomputer since 2016, with allocations obtained via the National Science Foundation’s XSEDE (eXtreme Science and Engineering Discovery Environment) program. To date, some 2 million core hours have been used. The optimal model configurations by this study were adopted by the sea fog forecasting system from the Ocean University of China about one year ago, based on draft manuscripts of this research study. The Ocean University of China and University of Oklahoma researchers continue their collaboration to improve meteorological forecasting models in order to reduce the damage of meteorological disasters around the world, with support from supercomputers such as Comet. This work was supported by theNational Key Research and Development Program of China(2017YFC1404200,2017YFC1404100) and theNational Natural Science Foundation of China(41276009). The first author received support from China Scholarship Council and the second author was partially supported by theNOAA VORTEX-SE Program through grantNA17OAR4590188 and U.S.-based National Science Foundation (NSF) XSEDE allocation grant TG-ATM160014.